Thanksgiving was first observed by the Pilgrims after they had survived a very difficult winter after landing in this country at a time when it was too late in the season and too cold to plant crops. By the following fall season, their crops were bountiful and they celebrated with a huge feast. What happened to that joyful celebration? It seems there is more advertisement about Black Friday than there is Turkey Day (or Tofurky Day if your Vegan). Granted we have not endured such a struggle as the poor Pilgrims; but we have endured a struggle of times in our economy and why not take time to do a little celebrating. And even better….take time to give thanks! What are you thankful for? It’s Happy List Time Again!! That’s right. Sit down and stop your crazy world just for a moment to make a list of all the things that you feel you can be thankful for in this world. Everyone should really have a minimum of 50 things on their list and most should easily top a couple hundred. That’s right!! I said a couple hundred things to be thankful for today. What’s wrong with you? Are you blind? Look around you and open your eyes to all the beauty and wonderful things around you. There are places where there is fighting going on continuously, day in and day out, and places where people are hungry and suffering, and other places where the very best one will every experience is a small little one room shack with dirt floors. How can we not feel thankful?!! How can we not think of stopping this crazy world for just ONE day to sit with friends and family and take the moment to appreciate all our blessings. I know everyone likes a good bargain, but does the infamous Black Friday have to become such a focus for this week. It really should just be one of those “maybe I’ll see what the stores have to offer” experience rather than a huge circled day on the calendar. I’ve worked retail during that time and it is a real zoo. Some people have fun and they are there with friends or family having a good time after sharing a big family meal together. However, many are rude, angry, and will stop at nothing to get the items they have decided they deserve for this holiday shopping extravaganza. They can turn a table of freshly stacked clothes into an unruly, twisted mesh of fabric in less than 10 seconds! Sometimes, it seemed they really didn’t even have a thought of purchasing from the stack, but just couldn’t help themselves in tackling the pile with their violent outbreak. And look out if the store happens to run out of an item!! I think some would lie down in front of the door until you had the item personally delivered to them and it better be there in 5 seconds max. I’d like to think that most are just out trying to save a little money or get a head start on their Christmas list, but at least you could be nice to other people while you’re doing it. And are you going to enjoy this Thursday with some of your family or maybe some really great friends? Before you dive into your feast and stuff yourself until you feel you are going to explode, how about you just take a moment for everyone around the table to express a few things that they feel are blessings in their lives. It doesn’t have to be anything dramatic or sensational….some times it’s the little things that leave us feeling the most thankful and joyful. Be sure to not let the moment pass to let someone know how much they matter to you too. Thanksgiving is a good time to show your appreciation for the special ones in your life who have helped you along the way. I feel very blessed this year to be spending the day with my sweet son. I’m looking forward to catching up on a few weeks of missed time. I want you all to know that You Matter. You can make a difference in this world by just appreciating the beautiful people and things around you. 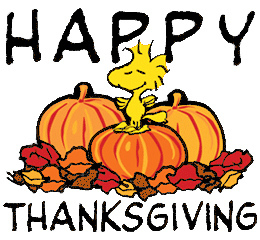 So Happy Thanksgiving to all of you. I hope Thursday is a very special day for you. Make it happen!